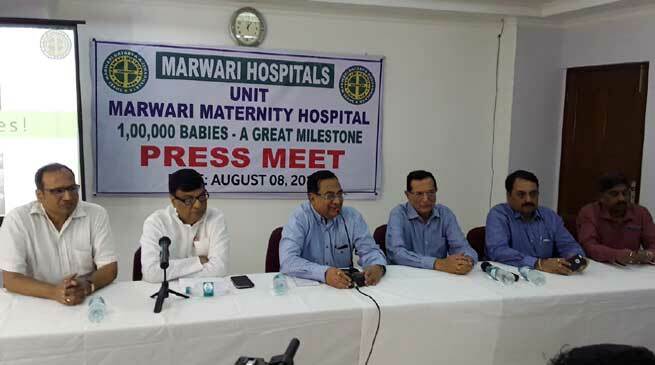 Marwari Maternity Hospital, a unit of Marwari Hospitals has set a new record by giving birth to 1 Lac babies by end of May this year since its inception in October, 1985. This milestone has added further glory in journey of the organisation which recently celebrated its 100 years of completion. It’s really a pride moment for us. Briefing media personnel on this achievement, Shri Sarat Kr. Jain, President, Marwari Hospitals said, “There are hardly hospitals in the country under Private Sector which have achieved what we have, which means that local pregnant women and their families really do have a top class service on their doorstep. Our achievement speaks about dedication and personal care of doctors, nurses, paramedical staff, etc. “Hospital has come a long since the day of October 23, 1985, a journey that at many times seemed difficult and harrowing. But everyone here kept faith in the saying that “there was never a night or a problem that could not defeat sunrise or hope. Due to charitable nature of the hospital, low cost facilities are being offered to the weaker section of the society, irrespective of caste, creed and religion. This institution has already accepted the challenge of life which is to live it with compassion, courage, justice and fortitude”, Shri Jain added. The hospital provides mother and child care facilities specially infertility, pre-pregnancy, post- pregnancy, including neo-natal care. The hospital is able to make a health system more pro weaker sections of the society, gender sensitive and patient friendly. Marwari Maternity Hospital is also engaged in implementing the various govt. sponsored schemes and programmes such as Janani Suraksha Yojna, Majoni and Aadarani ambulance service. The Maternal Mortality Rate (MMR) and Infant Mortality Rate (IMR) at Marwari Maternity Hospital could be compared with the best managed hospital of repute in the country. From the data available, the MMR and IMR of our hospital in the year 2015-16 is 0.02% and 0.39% respectively. Marwari Maternity Hospital had signed a MoU with European Commission under PPP model in the year 2002 under which hospital had been facilitated European Commissions Health and family Welfare Sector Investment Programme funds for providing an agreed set of RCH outreach services in the city in 8 low income wards of the Guwahati Municipal Corporation, covering a population of around 4.00 lacs. The rationale for providing these services was to achieve a public health impact as measured by increase in immunization rates, increase in contraception and family planning services and maternity services among the urban poor in Guwahati. The Marwari Maternity Hospital has been fully refurbished in recent years and can provide care for all women, from low-risk births in the purpose-built Midwifery-Led Unit, which offers birthing pools, ambient mood lighting, en-suite facilities and private courtyards, through to those who may require more attention in the traditional Labour Ward. A new high-dependency area is available for women who may require more intensive specialised care during labour, further increasing the safety of their care, whilst home births are also offered, all supported by a team of dedicated and highly qualified Midwives. Arunachal- State News in Brief, 26th Nov 2017.